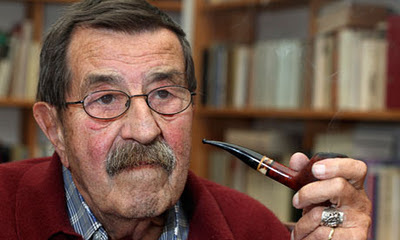 Gunther Grass is often lauded as the spokesman for a generation of Germans who grew up during the Nazi era. In 1999, he received the Nobel prize for Literature, but it was his Explosive debut novel The Tin drum which took the literacy world by storm. this is the autobiography of Oskar Matzerath, and is, we are told, written in a sanatorium in the early 1950s, but it begins in Poland in the 1900s when Oskar's mother marries Alfred, a shopkeeper. Oskar, however, may be the child of an affair with her cousin Jan. At the age of three, Oskar decides as an act of will and of protest at the stupidity and wickedness of adults that he will not grow, and communicates largely through his tin drum, from which he is inseparable. Set primarily in Grass's native Danzig, the shadow of Nazism hangs heavy over the first two-thirds of the book, with Kristallnacht, the fall of Poland and ultimately the Soviet capture of the city all refracted through Oskar's eyes, as is the plight of German refugees struggling westwards ahead of the Red Army. The Tin Drum is a marvellously memorable novel, both for the treatment of its subject, and for the richness of the images, the ironic humour and wit of the text, the power of the writing and towering, enlightened imagination of its author. Born in the free city of Danzig (Now Gdansk, Poland) on Oct. 16, 1927, Günter Grass was strongly influenced by the political climate of Germany in the era following the disasters of World War I. A Hitler "cub" at 10 and member of the "youth movement" at 14, the boy was infused with Nazi ideology. At 15 he served as an air force auxiliary; he was called to the front and was wounded in 1945. Confined to a hospital bed and then a prisoner of war, Grass later was forced to view the liberated Dachau concentration camp. He left the army at the age of 18, angry about the loss of his childhood, about the fierce and ugly German nationalism which had robbed him of it, and about the almost total destruction of the city of his youth. In 1949 he began to study painting at the Düsseldorf Academy of Art, at nights supporting himself as the drummer in a jazz band. He also started to write, poems at first, beginning slowly, experimenting with forms, working out his relationship with the past. When he moved to the Academy of Art in Berlin in 1953, he later said, "I came as a writer." Grass was awarded the 1999 Nobel Prize in literature for The Tin Drum.The Swedish Academy felt the novel would become "one of the enduring literary works of the 20th century." Though the Academy cited The Tin Drum, the award was given in recognition of Grass's body of work.